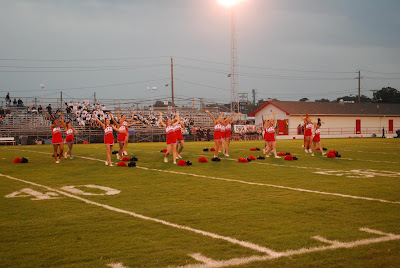 What football game is complete without cheerleaders to fire up the crowd and root the team on? I haven't checked my NFL picks, but I dont think I did very well. It was a wild day. My favorite has to be the Jets getting over on the Patriots. I know its early but this is a good weekend to review. The State Fair of Texas begins on Friday. Are you going? Some people in Arlington were upset that the new Cowboys stadium was being called the Palace in Dallas, when its actually in Arlington. They should be upset that the Cowboys lost. The Palace in Dallas has a nice ring to it, I hope it sticks. Remember when Michael Irvin was playing and the Cowboys would play on Monday night at Texas stadium, Irving, Texas was always called Irvin, Texas because the announcers didn't know any better. I am taking today off, I have work to do around the house. See you tomorrow.